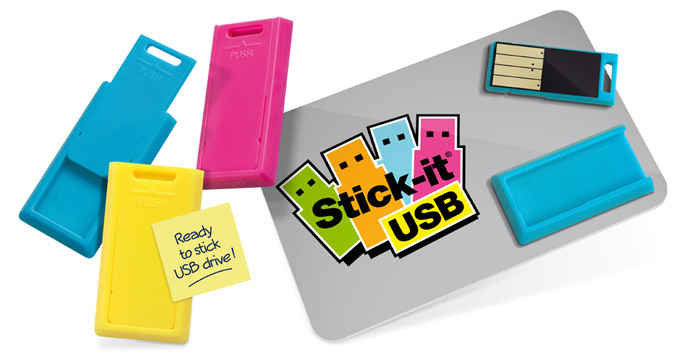 With this revolutionary ready-to-stick USB drive you can add digital content to any document in a flash! Easy to remove and line up thanks to its adhesive support that remains in place. Some of the existence of USB flash drive are bulky and makes the drive difficult to connect to the USB port. Because the USB port connectors on computer housing are often closely spaced, plugging a flash drive into a USB port may block an adjacent port. It would not be an issue anymore by using this ready-to-stick USB drive. As the device comes with a reusable sticky base and the USB connector simply slide out making it really easy to use. In just 3 simple steps - 1.Slip the USB out, 2.plug-it in, 3.Replace after use. It comes with a tiny dock that allows it to be stuck on any flat surfaces which is ideal for your business card, marketing flyers, brochures, user manuals, conference folders, anything or even on other souvenir gifts to get value added on the gift itself! Instead of giving your good old catalogue, stick your USB on it and give your clients and prospects directly to your PDF or e-catalog! You will stand out, relieve your client's shoulders and save loads of paper and money. Your digital information will stick to everything you distribute and cleverly enrich your communication. You don’t even have to worry about loading the data onto the promotional USB stick yourself either because if you have it ready then we can data-load all of the USB flash drives for you at no cost before we send them out. We do provide full color offset press printing service in various finishing including matt, glossy lamination or without finishing (round corners with an extra cost). We print on stock 260gsm art card, 310gsm art card, 280gsm frosted plastic card, 500gsm plastic card and etc.